These were the nails I was going to enter in to the Chalkboard Nails nail art contest that is going on right meow, but I didn't LOVE them enough.. I think my base colour was too "dark" and I could have chosen a lighter blue. Oh well, back to the drawing board. 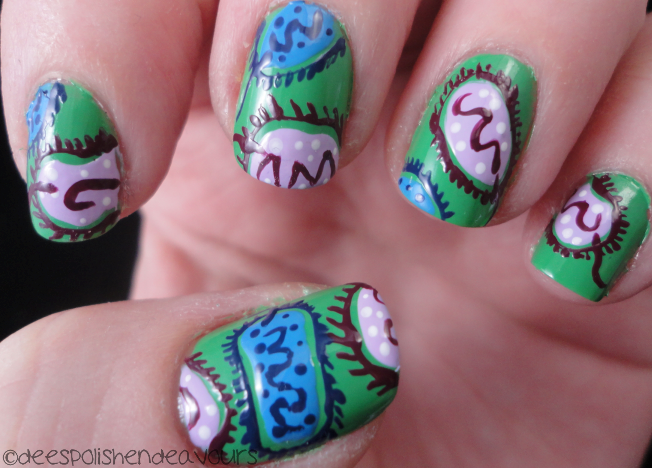 These "bacteria" nails are based off of the fabric I found HERE. The base is Essie Mojito Madness (which I happen to be madly in love with now), the light purple is China Glaze Sweet Hook, the dark purple is China Glaze Purr-Fect Purple (thankies fall luxebox! ), the "light" blue is OPI No Room For The Blues, the dark blue is China Glaze First Mate, and the white is China Glaze White on White. Well, that is all for today! See you back again for day 11! And be sure to check out Silver's blog to see what she posted up for today - take care!! LOVE them! I was going to say mitochondria, so I was THIS close!!! woot woot! such great nail art skills!